​​Barcelona new boy Arthur Melo has reportedly been handed the famed number eight shirt at the Camp Nou after the departure of the legendary Andres Iniesta, after eagle eyed fans spotted a key indicator in Arturo Vidal's announcement video. As highlighted by some switched on viewers, fans of the Catalan based club spotted the former Gremio man's image in the Camp Nou dressing room between Gerard Pique and Sergio Busquet's positions during Vidal's presentation. ​​The 21-year-old only arrived at the club this summer in a reported £40m move from Gremio, but the Blaugrana are clearly pinning their hopes on the Brazilian being as effective as the departed Spanish icon by giving him the illustrious number eight shirt. In fairness, the youngster did nothing to quash the hype surrounding him with a thunderous strike against ​Tottenham on his debut for the club, perhaps suggesting that he could, in time, be a more than competent replacement for Iniesta. The signing of the experienced Vidal to play alongside him in midfield should ease him into life at arguably the biggest club in the world, although the decision to give him number eight will do no favours for easing the pressure on his young shoulders. 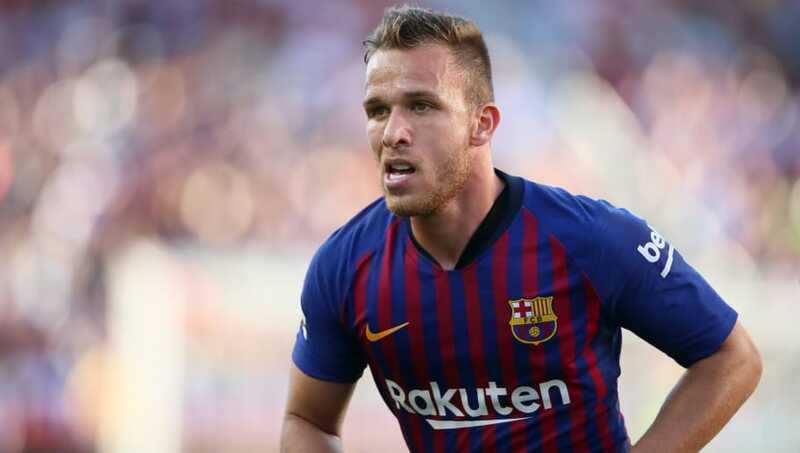 At just 21 years of age, however, Arthur has received a call up to the Brazil squad, whilst also playing 66 times for Gremio, winning the Copa do Brasil and the Copa Libertadores.